Courtney Love is a prominent American musician and actress. She is most famous for being the lead singer of Hole, the main songwriter behind Live Through This , and the widow of Kurt Cobain. To some, Love is a modern-day Nancy Spungen or Yoko Ono. To others, she is a genius and a goddess. Called by Rolling Stone "the most controversial woman in rock," Love has reached iconic status, if only because she is so often imitated by younger, up-and-coming women in music and movies. 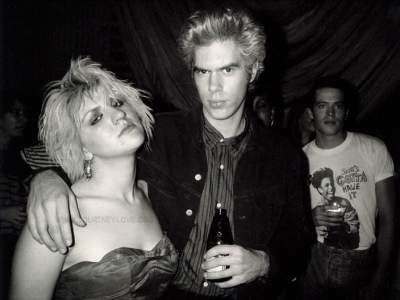 In 1986, then-22-year-old Courtney Love auditioned for the role of Nancy Spungen in Alex Cox's film Sid and Nancy. She didn't get the part, but she did get a supporting role as "Gretchen," Spungen's fictionalized best friend. ("Thank god I didn't get that part," Love later said.) A year later she appeared on "Fifteen Minutes" with then-famous songwriter Robbi Nevil. In the above interview, Love wore what looked like a peach-colored nightgown over a vintage dress. It was in the mid-1980s that Courtney Love and Kat Bjelland first developed the kinderwhore style, though their later fame made this style more popular in the 90s than in the 80s. By this time, Love had already been a stripper, a Mickey Mouse club rejectee (she read Sylvia Plath at the audition) and, briefly, the lead singer of Faith No More. She would go on to star in Straight to Hell, a deservedly forgotten film by Alex Cox. 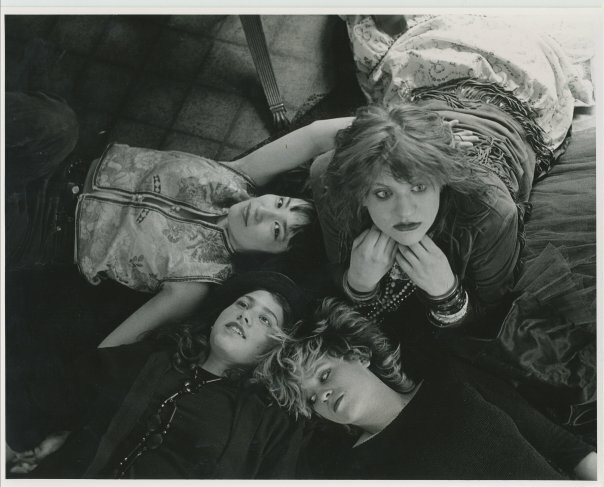 Publicity photos for "Sugar Babylon," a group featuring both Love and Kat Bjelland, show a young, somewhat heavy Courtney Love in, alternately, a hippie skirt, a 1940s dress and a shiny, off-the-shoulder top. In the early 1990s, Love was still dressing in vintage babydoll dresses, especially onstage; this popularized the kinderwhore look which she'd adopted many years earlier. Courtney Love was vocal in her dislike of the riot grrrl movement. "I really liked Tobi [Vail] and Kathleen [Hanna] in the beginning, and then I just thought they were hypocrites," she said in an interview with Spin. Love objected to Riot Grrrl's doctrinaire attitude ("being offended is part of being in the real world") and the quality of the music. It didn't hurt that Tobi Vail, bassist for Bikini Kill, was Kurt Cobain's ex-girlfriend. Hole released its first album, Pretty on the Inside, in 1991. The album was critically well-received and influenced later artists, from the Distillers to even the riot grrrls whom Love disliked. Courtney met Kurt Cobain in January 1990, in Portland's Satyricon nightclub. They married two years later. Love wore a satin and lace dress that once belonged to the actress Frances Farmer, while Cobain wore pyjamas "because he was too lazy to put on a tux." They had one child, Frances Bean Cobain, in August of the same year. Kurt Cobain died in 1994, of a gunshot wound to the head. A suicide note was discovered near his body. Various conspiracy theories have implied Love had some involvement in his death, but no hard evidence has ever surfaced to this effect. Courtney Love remained in the limelight after her husband's death. Her band, Hole, went on tour as scheduled. Their album Live Through This was a critical and commercial success. In 1996 Love starred in The People vs. Larry Flynt as Althea Leasure, Flynt's longtime partner. Love began to change her aesthetic during the mid-90s. She famously showed up at the Oscars in a white Versace dress, with immaculate hair and makeup. This was "glam" Courtney, hanging out with A-Listers and wearing couture. Her boyfriend, Edward Norton, was stable and gave her happiness. In 1998 Hole released "Celebrity Skin," which was also critically and commercially successful. It was in the 2000s that Love's status as a style icon began to slip. Her erratic behavior, financial problems and botched solo album made her more of a tabloid punchline than an icon. The internet, and the 24 hours news cycle, made media exposure for all celebrities (not just love) more widespread and more oppressive. It wasn't all bad, though. Love co-created the manga series Princess Ai, with Ai Yazawa and Stu Levy. She authored and released the book Dirty Blonde: The Diaries of Courtney Love. She went on tour and wrote a long essay about the malfeasance of the record industry. Love has recently, hopefully, been on the upswing. Hole's latest album, Nobody's Daughter, was just released. Love has started dressing in a Stevie Nicks/Fairy princess vein, with many loose layers, head dresses, and jewel bracelets. Return to Enjoy Your Style's icons page.